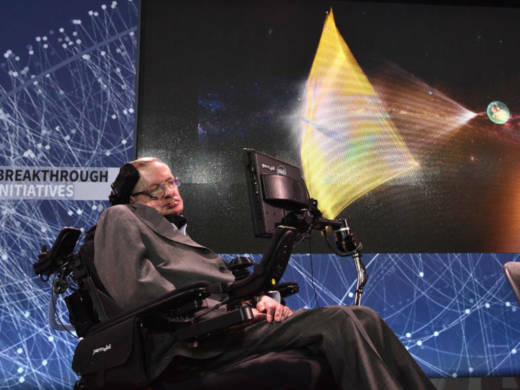 Stephen Hawking, shown here in April 2016 during the announcement in New York of a new space exploration project called Breakthrough Starshot, is one of 150 top U.K. scientists who've warned that Brexit would be a "disaster for science." The world's best-known living physicist, Stephen Hawking, says that President Trump's decision to pull out of the Paris climate change accord could lead humanity to a tipping point, "turning the Earth into Venus." The Cambridge professor and renowned cosmologist made the remarks in an interview with the BBC that aired Sunday. "We are close to the tipping point where global warming becomes irreversible," Hawking told the BBC. "Trump's action could push the Earth over the brink, to become like Venus, with a temperature of 250 degrees, and raining sulphuric acid." Hawking, who is best known for his discoveries about black holes, called climate change "one of the great dangers we face, and it's one we can prevent if we act now. "By denying the evidence for climate change, and pulling out of the Paris Climate Agreement, Donald Trump will cause avoidable environmental damage to our beautiful planet, endangering the natural world, for us and our children," Hawking told the BBC. It's not the first time that Hawking has blurred the lines between science and politics in his public pronouncements. In December, for example, he wrote in an editorial in The Guardian newspaper that Brexit and the election of Donald Trump were "a cry of anger" aimed at the elites, such as himself, in both America and Britain. He said that we are "at the most dangerous moment in the development of humanity."